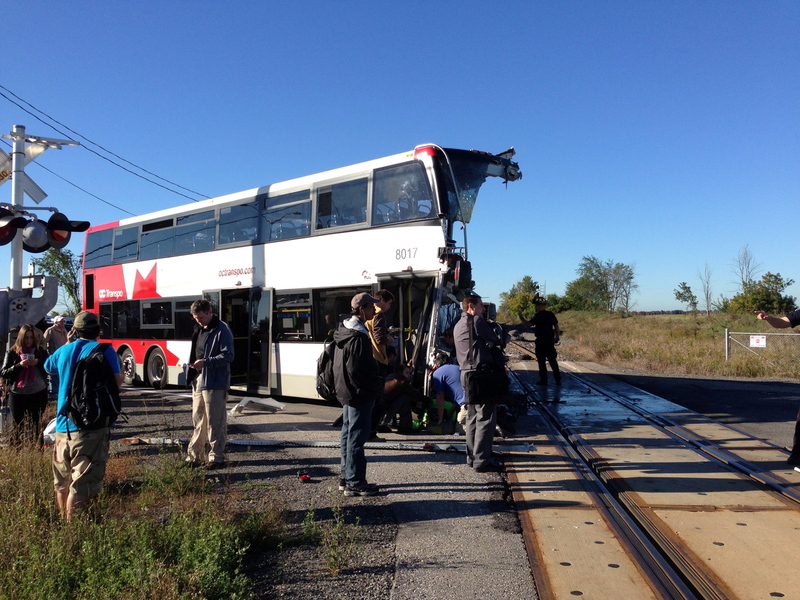 Just before 8:50 on Wednesday morning, a northbound OC Transpo double-decker bus collided with a VIA Rail train along Woodroffe Avenue near the Fallowfield transit station. The collision left the front corner of the bus shorn clean off. Six of those on the bus were killed by the collision, five declared deceased at the site and a sixth who perished after arriving at hospital. Among the dead was ten-year veteran OC Transpo bus driver Dave Woodard, who may be remembered as one of several operators who volunteered their time to shuttle disabled residents around the city during the 2008-09 OC Transpo strike. 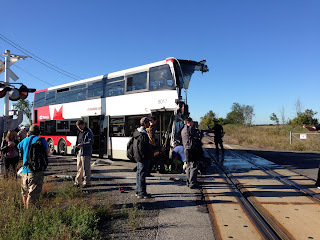 Over 30 other passengers from the bus were treated for injuries in hospital, but thankfully none of those on the VIA Rail train suffered any injuries. While this description coldly offers the grim details of the tragic incident, it fails to capture much else about it--including the emotion that took over the City of Ottawa. The collision has left residents across the city shocked and feeling vulnerable to a degree that isn't typical of our usually sleepy town. I found out about the incident while standing on a 95 riding through downtown. There was a young woman sitting beside me, talking on the phone and crying. A lot. It was obviously a personal matter, but I couldn't help but overhear snippets of her conversation; things like, "... the driver may be dead... " and, "... my brother was on the bus." That last word made me fear it was more than a car accident, so I checked Twitter on my phone; sure enough, the initial reports had begun flooding in from all the local news sources. As often as I could I updated the nwsfeed, but sadly the news didn't improve--in fact, the details seemed to get more grim as they came in. More information about what happened to cause this tragic incident will surely come in the days and weeks ahead. In the meantime, my thoughts are with the families of those who were killed or injured in Wednesday's collision. Thanks are due to the first responders and hospital staff whose quick and decisive work prevented this crash from becoming an even more horrifying one. Thanks are also due to the bus drivers who get us to work and back every day. Their jobs aren't as easy as many assume, so they deserve our gratitude and respect--especially after an event like today's, which must have them as shaken as anyone else. So when you're getting on or off the bus this week, make sure you say thank you to the operator who got you where you needed to be. If you can, try to make a habit of doing it regularly; I'm going to. I live in Halifax and was shaken here. I have lived in Ottawa and I know the spot where it happened and even today more then 24 hours after the fact I am still shaken. My heart goes out to everyone that was affected and for those that lost someone I am sorry for your loss. I am thankful the first responders were able to rescue as many people as possible and save as many lives as possible. Thank you for posting this and giving us a non news site version of the story.